It was Tuva that was chosen by President Vladimir Putin out of 88 Russian regions to host Monaco Prince Albert for a 3 days-holiday. Interesting to note that just before this high visit, on August 12, it rained heavily in Kyzyl, where the last 2 weeks the temperature stayed at +30-35 (Celsium). Kyzyl residents thought the rain a sign for the weather change but on the next morning the sky was again virgin blue and the temperature quickly recovered from +13 to its +30-34 (Celsium) and stayed like this during the whole visit. The airplane 'Russia' landed in Kyzyl airport at 10.05 a.m. August 13. The high guests were greeted by Sergei Shoigu, federal minister for emeregency situations, native of Tuva, and Sholban Kara-ool, head of the republic. Putin and Alber the Second several minutes after the arrival mounted a helicopter which was taking them from one beautiful place in Tuva to another. The only media chosen to cover this informal visit were a Russian television crew and a RIA-Novosti correspondent. The TV showed them entering a yurt, a tent used by Mongolian nomads, and touring the grounds of the Por-Bazhyn fortress, a clay labyrinth built more than 1200 years ago when the region was ruled by the Uighurs, a Muslim, Turkic-speaking ethnic group. An archaeological dig is under way at the site in preparation for restoring the fortress, a pet project of Emergency Situations Minister Sergei Shoigu, who accompanied the two officials on their visit. 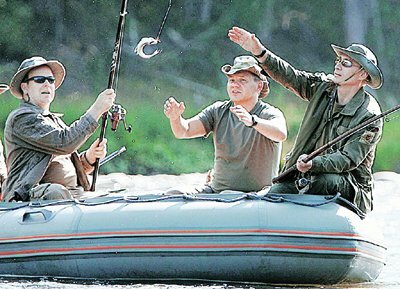 Later, Mr Putin and the prince went rafting and fishing along the Yenisey River. Both Putin and Alber caught graylings. They travelled around Tuva and saw places where few of Tuvans have seen due to their inaccessibility by cars. They've been to Xhaa-Khol, Khemchik and yeasterday, August 15 at 4 p.m. local time landed in Kyzyl, sun-tanned and relaxed. The prince took a plane to Irkutsk. 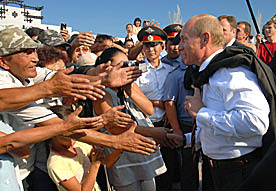 The President went to the city where on the Arat square he was greeted by a crowd. He approached people, and streched a hand to the closest to him. Vladimir Putin entered the Governmental building where on the 3d flour he had a meeting with Sholban Kara-ool. 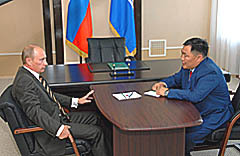 The two shook the hands and Putin started the meeting with the greeting to the Tuvan people in connection with the Tuvan festival - Naadym. He also confessed that his impressions of the Tuva's nature and beauty are immense. Sholban Kara-ool told the President about the socio-economic situation in the republic. The conversation last half an hour, after which the two accompanied by the members of the Gvernment went to the Centre of Asia monument. Kara-ool, acting as a guide, spoke of the history of the monument, foundation of the Kyzyl on the place where the Pii-Khem and Kaa-Khem blend together giving birth to Yenissei. 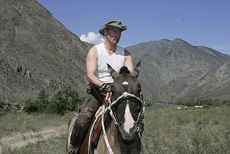 Mr Putin took a plane heading to Bishkek at 6.08 p.m. He was seen of by Sergei Shoigu and Sholban Kara-ool.